Santa is getting ready to get in his sleigh and on his way, delivering toys and goodies to ALL girls and boys! Did you know Santa is really already out there delivering toys to good little girls and boys on the other side of the world! YES! They are a DAY ahead of us! While I am waiting till bedtime so Santa can come over to MY house here in the United States, I am going to do today's Holiday Break Reading Challenge sponsored by Edifying and Edgy and share it ALL with you! Merry Christmas Eve. For today's activity I want everyone to think about books that have Christmas as an important part of the story. Post the cover and the synopsis so we can see what it is about. Why? This book has EVERYTHING you EVER wondered or wanted to know about Christmas in it! I won this book last year, Christmas 2010, from Bookreporter.com in their Holiday Cheer Contest, and it is a treasured book! 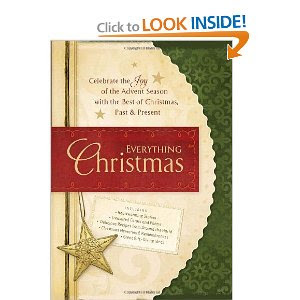 It has EVERYTHING you could possibly want to know and NEVER KNEW about Christmas in it!! It starts with December 1st and goes ALL the way through December 24th. For example: December 1st starts with a poem called "Let Us Keep Christmas" by Grace Noll Crowell and continues on with the "History of Christmas". The next topic is "Christmas Every Day" by William Dean Howells, then there is a little poem, a recipe for Scented Applesauce-Cinnamon Ornaments, Mmmmm! Another recipe for Chestnut Dressing, Roasted Goose, and then a Christmas Hymn, "O Little Town of Bethlehem" by Philip Brooks, then a Historical Note and a Bible verse. December 2 starts with "The Merry Family Gatherings" by Helen Lowrie Marshall, and goes onto the 1932 Royal Christmas Message by King George V and Rudyard Kipling, broadcast LIVE over the radio! Then they talk about Christmas Dinner in England which is like our traditional Thanksgiving Dinner! Followed by some trivia, MORE recipes, Colorful Pine cones for the Fireplace, The Wooden Shoes of the Little Wolff by Francois Coppe'e and MORE!!! EVERY Day is a NEW Chapter! Imagine a book FILLED with things like this and MORE!! There really is SO much more in it. It covers other Christmas Traditions in other countries, Christmas articles, GIFT IDEAS, MORE recipes. Want to know the lyrics of a song? They are there! Would you like to learn how to make Gingerbread Men and Pavlova? It's in there! Want to learn how to make holiday bows? It's in there! I'll be willing to be there isn't "ONE" thing you could question or ASK about about Christmas and it WOULD BE IN HERE! I LOVE this book! I will truly cherish this book forever! It will remain on my shelf forever, as well! I had such a wonderful time reading this book, and you will, too! I promise! I have NEVER come across a book like this that covers EVERYTHING CHRISTMAS!! You will NOT be disappointed if YOU want to to purchase this TREASURY OF Christmas, as it IS divine! Even the cover of the book necessitates a place on your coffee table, yet this one WILL BE READ!! Here's the link to purchase it if you would like! Now, get to bed so Santa can come!!! No! Don't pretend! REALLY GO TO SLEEP! Remember, Santa KNOWS WHEN YOU ARE SLEEPING! HE KNOWS WHEN YOU'RE AWAKE!! SANTA CLAUS IS COMING . . . TO TOWN!!!! Merry Christmas Laurie! May God continue to bless you.